Findagrave.com, memorial #36121036. Photo by BobBoston. [S97] Charles Edward Banks, Planters of the Commonwealth, 71, Winthrop Fleet. [S210] Edward P. Johnson, Woburn Records, 4:8, Deacon Josiah Conuers, epitaph & notes. [S210] Johnson, Woburn Records, 4:8, Deacon Josiah Conuers, epitaph & notes; 4:18, Lieut. James Conuers, epitaph 59 & notes. [S222] Lucius R. Paige, "Massachusetts Freemen," 10, 11, Edw. Converse. [S1590] Nathaniel B. Shurtleff, Records of the Massachusetts Bay, 1:88-89. [S1590] Nathaniel B. Shurtleff, Recs. of the Massachusetts Bay, 1:297. [S522] Samuel Sewall, The History of Woburn, 1:11. [S522] Samuel Sewall, Hist. Woburn, 1:14. [S522] Samuel Sewall, Hist. Woburn, 1:71-2. [S520] Anderson, Sanborn and Sanborn, The Great Migration, 1634–1635, 461, Edward Converse. [S1640] Edward F. Johnson, Early Woburn Deeds, 5, Converse/Brooks (Book 1, Page 90). [S210] Johnson, Woburn Records, 3:284, footnote to Tottingham. [S298] Cutter & Loring, Brooks Family of Woburn, 3-4, Henry (1.) Brooks. [S522] Samuel Sewall, Hist. Woburn, 1:72. [S210] Johnson, Woburn Records, 2:39, Sarah Converse d.
[S210] Johnson, Woburn Records, 3:59, Edward Converse/Joanna Sprague m.
[S210] Johnson, Woburn Records, 2:39, Dea. 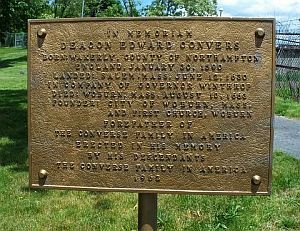 Edward Converse d.
[S210] Johnson, Woburn Records, 2:39, Joanna Converse d.
[S1290] Ellen Knight, "Slavery Was Part of Winchester History," Daily Times Chronicle, Winchester Edition (24 Feb 2000). Hereinafter "Slavery." [S522] Samuel Sewall, Hist. Woburn, 2:578, Selectmen. [S1640] Edward F. Johnson, Early Woburn Deeds, 7-8, Converse/Mousall deposition (Book 2, Page 197). [S210] Johnson, Woburn Records, 4:8, Deacon Josiah Conuers, epitaph 1 & notes. [S1640] Edward F. Johnson, Early Woburn Deeds, 5-7, Richardson/Henshaw (Book 1, Page 1). [S210] Johnson, Woburn Records, 4:18, Lieut. James Conuers, epitaph & notes. [S522] Samuel Sewall, Hist. Woburn, 1:73. Findagrave.com, memorial #7725854. Photo by Jan Franco. [S210] Edward P. Johnson, Woburn Records, 4:8, Deacon Josiah Conuers, epitaph 1 & notes. [S522] Samuel Sewall, The History of Woburn, 2:605. [S210] Johnson, Woburn Records, 3:59, Josiah Converse/Esther Champney m.; 4:8, Deacon Josiah Conuers, epitaph 1 & notes. [S522] Samuel Sewall, Hist. Woburn, 1:85. [S522] Samuel Sewall, Hist. Woburn, 2:589. [S522] Samuel Sewall, Hist. Woburn, 49. [S210] Johnson, Woburn Records, 1:57, Josiah Converse b. [S308] Thomas W. Baldwin, Vital Records of Cambridge, Massachusetts, To the Year 1850, 2:71, Richard Champny/Jane ____ m. England. [S1590] Nathaniel B. Shurtleff, Records of the Massachusetts Bay, 1:342. [S308] Cambridge VR, 2:500, Richard Champney d.
[S210] Johnson, Woburn Records, 3:59, Josiah Converse/Esther Champney m.
[S308] Cambridge VR, 1:126, Mary Champne b. [S308] Cambridge VR, 1:126, Samuel Champne b. [S308] Cambridge VR, 1:126, Sarai Champne b. [S308] Cambridge VR, 1:126, John Champne b. [S308] Cambridge VR, 1:127, Daniel Champney b. [S308] Cambridge VR, 1:127, Lydia Champny bp.